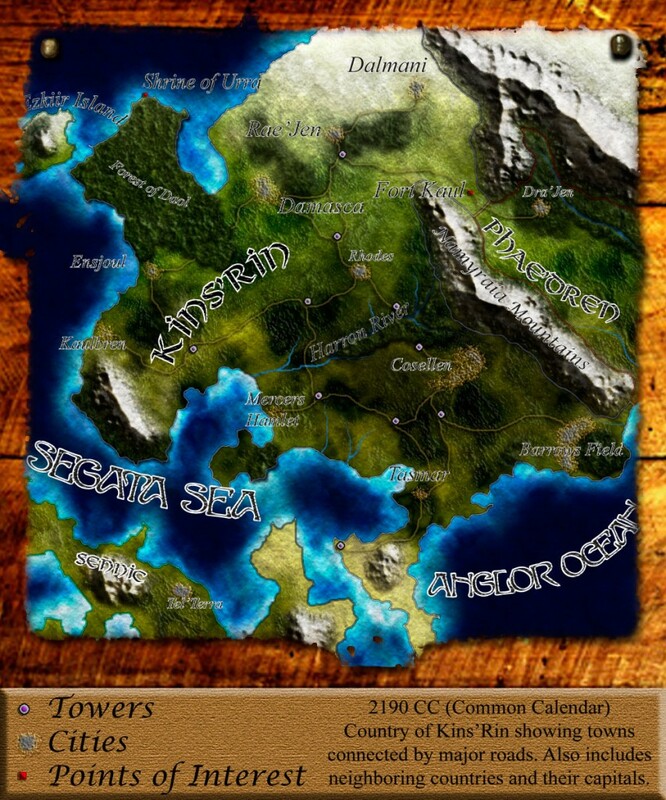 This is a mapmaking competition entry from Duncan Peterson. The country of Kins’Rin is ruled by three people known as Arbiters who rule in three different cities. The central capital, Damasca, is ruled by Arbor. Once a common soldier, he was appointed by the former Arbiter as the master of Damasca for reasons unknown to any but the last arbiter. He is charged with handling overland trade. The second Arbiter is Jörs. He has been the Arbiter of Barrows Field since his sixteenth birthday, when his father, the former Arbiter, was assassinated and left him as heir. He spent the next ten years waging a private war against his mother, the one he believed was the assassin. His proof came when she tried to kill him as well. His mother was exiled and secretly killed. He is now in his late eighties. His job is overseeing all overseas trade. The third Arbiter is known only to a select few. Her real name is Clair. She commands from the city of Dalmani, or so it is believed. This is the original capital of the country, before it was split into three power centers. Hidden in the mountains is the original castle as well. The castle is constructed around the skeleton of an enormous creature long believed to be a dragon. Clair commands the military of Kins’Rin. The third Arbiter is always called Blood Moon, and is never referred to as either a man or woman, since none actually know, and none are ever told when the Blood Moon has changed. They never speak, but instead communicate through one of the sacred cats only found in Kins’Rin. Cats are much like the ones found on earth, only these are much larger and are intelligent. There are three kinds of cats, each becoming increasingly larger, and each gaining another split in their tail. A standard cat (Tier-One) is about five times larger than a typical house cat. At birth they are the size of a normal cat. They have the ability to speak many different languages which allows them to communicate with humans on behalf of the rest of their race, for humans lack the capacity to speak the languages of cats. In their natural setting, these are used as messengers between the different tribes of cats, most of whom have their own language, as well as hunting small game. They are also the only tier that can breed. A grand cat (Tier-Two) begins as a normal house cat, but is the size of a standard work horse when fully grown. They have two tails and can only speak the languages of cats. They are used as work animals in Kins’Rin, while horses are used only in the military. They work willingly for humans, but if they are ever mistreated, they typically eat the abuser. Such cases are very rare. In their natural setting, they are used to hunt large game and defend the youth of the tribe. A spirit cat (Tier-Three) is born the size of a standard kitten, but it never stops growing. Only one spirit cat exists per tribe, but since the settling of Kins’Rin seven-hundred years ago, the appearance of such cats has declined. Only four tribes of cats are known to exist in the wild, and only two of those have a spirit cat. It is thought that others exist and simple haven’t been seen yet. Many legends exist about the spirit cat. The main one inspired their common name. Legends told by the cats speak of times when spirit cats would walk into the world beyond the world. Humans call it the spirit realm, and so came the name spirit cat. Legends also speak of spirit cats who would walk on the ocean like it was land, or swim through the earth like it was water. No one is certain if these legends have any truth to them. Spirit cats are born with three hearts, each with its own circulatory system. This is to support their bodies as they grow, and insures that if one heart is destroyed, they can still function for many years. Long enough for another spirit to be born without leaving the tribe without a defense. Like most cats, they can make their fur stand on end to make themselves look bigger and more intimidating. Due to their small size at birth, they have evolved much longer fur, which is normally tucked under their first layer of skin. When enraged or frightened, they let their fur come completely out. At the age of 20, one of these cats will usually be ten feet tall, with a normal fur length of one to two feet. Extended, the fur extends to seven to eight feet. It also makes it difficult to know just where the cats face or tail are when it fights. Their job is defending their tribe against all things. Long ago, dragons were common in this area of the world, and on occasion they would fight against spirit cats. But, while there were dragons, the castle of the Blood Moon was not made around one of their skeletons, but the skeleton of a Spirit cat, the largest that has ever lived. It grew to be roughly half a mile in length, minus the tail (another quarter mile), and a quarter mile high. The current year is 2190 by the common calendar. At this point in the story, a war is about to begin for the first time in two-hundred years in the country of Kins’Rin. The first strike is against Sennic, at the port city of Tel’Terra. From Mercers Hamlet, the first strike team is sent out. When the town falls under the control of Kins’Rin, Fort Kaul deploys most of its forces to take the capital city of Dra’Jen, in the country of Phae’Dren. Cats begin withdrawing from human society, knowing that something terrible is happening. Dra’Jen and Rae’Jen were once meeting places of cats. With one of them under siege by Kins’Rin, they leave, heading to their sacred place, the Shrine of Urra. The other Arbiters, alarmed by the sudden actions of the Blood Moon, try to negotiate. But with no military force under their control, they are ultimately powerless. The true Blood Moon, Clair, is a part of the strike team in Tel’Terra, acting as team medic. She is the only one who knows that someone has taken her place. What was meant once as protection for the Blood Moon has now become its downfall. She works from within the military now to change the hearts of people and find those who will help her take back her place as Arbiter. Looks pretty good but the white stroke on the text kills it a bit. Glows might have been a better way to go there. I’m a big fan of doing towns like that, though. I love the satellite style and have been a student of Ascension’s in that area for some time now. The colors are overdone though, and detract from the presentation. Also, the mountains don’t transition well into the land surrounding them. In a satellite map, they should seem as one. Ascension has some tutorials that I’ve done, and they made a huge impact in my work. I’d like to encourage you to take a look and see if you think they have anything to offer you. Nice work, but I agree with the previous posters, that colors and contrast are a bit too strong in this map. I’d have gone for a bit more subdued palette. Nice story! very imaginative (I like it). Also the map looks pretty and supports the story. The terrain is detailled and I like the textures you used. I feel it is missing some finishing touch though: the texture on the border is too blurry (low-res) and the legend does not match the pretty map. Lovely sat-style map. I like the strong colors, these fit well. The legend seems very simple compared to the rest, could need some improvement. This is also true for the border of the map and the background. These don’t match the quality of the well done map. The map is pretty and I like the colour choices. It’s clear and I can easily see the different features. The rivers all make sense – and I really like the way you’ve done the forests – they blend into the style nicely. You have some issues with the sharpness. On the legend I can see every grain of the texture, but on the nails on the corners of the map I can’t even see a clear edge and the background texture is very blurry. You need to make the level of detail consistent. I agree that the legend isn’t up to the quality of the rest of the map – improving this would make a big difference. I also missed having a compass or scale. As it is I can’t see how far it is from place to place. So – great start on the map style. I think you’ll do very well with this Atlas style. The extras need some work, but with the skill you’ve shown with the map style I’m sure you’ll do a good job with the other pieces on your next map.